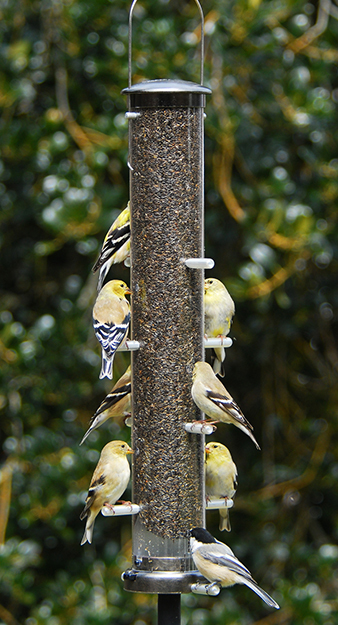 Finch feeders are great for attracting American Goldfinch. Goldfinch like to feed as a group and these feeders allows them to do just that. Goldfinch feeders have a very small feeding port and use Nyjer seed. We also carry accessories such as seed trays and weather guards to help catch seed and keep weather off your feeder. Droll Yankees new generation 15" nyjer feeder is one of our top selling goldfinch feeders. A simple well made feeder that will last for years. Droll Yankees Onyx clever clean nyjer feeder offers a quick release base and metal seed ports for durability. 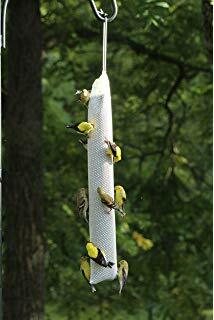 Droll Yankees new generation 36" nyjer feeder is great for large numbers of goldfinch. Holds more than twice the seed of the 15" and has 20 feeding ports. Aspects large 10 port nyjer feeder with quick release base. Aspects small 6 port nyjer feeder with quick release base. Aspects nyjer feeders are one of our favorite designs thanks to this quick release base that allows for easy clean out of clumped seed. We stock all three sizes of quick release nyjer feeders. 6, 8, and 10 port sizes. Wire mesh and sock type nyjer feeders allow goldfinch to feed more freely on the feeder. Birds feed from the entire surface of the feeder instead of a designated port. We stock both types of feeders at The Wood Thrush Shop. Aspects wire mesh nyjer feeders are durable long lasting. Add a weather guard to help keep out the rain. Nyjer sock feeders are the most affordable way to feed goldfinch. We stock multiple sizes and types of nyjer socks. These are great for someone just getting into feeding goldfinch.